Matthew Hart founded his own healthcare technology startup—Soter Analytics—after a full-time MBA at HEC Paris. 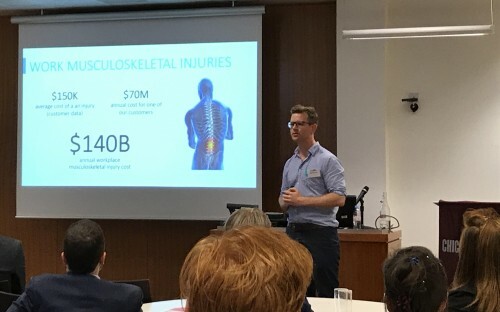 His main product, SoterSpine, combines wearable tech with big data analytics to help stop the causes of muscular skeletal injuries in the workplace—the most common and expensive injury category in industry. Though still in development, SoterSpine has already won accolades from Australia’s National Energy Resource Association, as well as the Western Australian Innovation award. Matthew estimates that his wearable healthcare tech, styled after a rugby shirt, can help reduce the causes of muscular skeletal injuries by 70%. Matthew was working in Australia for the biggest mining company in the world, BHP Billiton, when he decided to pursue his MBA. He had plenty of offers on the table for a higher position or a transfer somewhere else in the world, but he felt he’d learned all he could—an MBA seemed like a good move forward. His idea stemmed from his experiences at BHP, but it was at the HEC Paris MBA that his business took shape. Now, with an R&D office in St. Petersburg, Matthew is harnessing the science, technology and engineering talent in Eastern Europe. He’s looking to finalize his fundraising to bring his wearable device to the large pipeline of customers he’s built up. How did the idea for Soter Analytics come about? I was a reliability engineer at BHP where I collected data from machines and analyzed it to predict failures. When we could predict a failure, we were able to change out a component before it failed. This would save a lot of downtime and a loss of productivity. Some of the machines would have 10,000 sensors and I realized that there was a whole lot of missing data when it comes to industry. We have all the data for the machines, but what about the people that are fixing them or operating them? We had no visibility and no data on them. So, the idea was if we could put a sensor on a person, we could help them reduce their injuries, make the work slightly more productive and make it safer like we do with machines. The SoterSpine continuously captures human-movement data and notifies workers when they make an at-risk movement. We also analyze the data we collect and coach workers on how to improve their safety or productivity. How have you profited from your MBA experience? In the world of startups you need to be a master of everything—that’s what the MBA teaches you. I had an idea for a product which I thought would make an impact, and the MBA gave me the skills to make it happen. Before, I only had the engineering background. But if you’re just building a product that’s only half the story. You need to be solving customer problems and then understanding how to make money from that. Now, I have the business knowledge to run my startup and grow my business. Why did you decide to pursue an MBA at HEC Paris? I wanted to go to a well-established school with a high ranking to get a top quality education. Although I didn’t initially have plans to relocate to France or study in Paris, I knew that HEC Paris had a good ranking and a well-respected program. It also had great diversity and a good alumni network. I’ve used the network since graduating and have been introduced to customers by people I studied with. The international exposure of the program also helped me develop the confidence to do business globally. We have customers in Australia, Belgium, UK, Lithuania, and hopefully soon in the USA. Get exposure to all the different parts of business rather than specializing in one area. As the founder of a startup today, I’m talking to investors, journalists, my technical team, customers, and we’re building a new product and developing its strategy. There are so many different things involved with all those tasks, so it’s important to have a strong grasp of all elements of business. They’re all important. Also, network. For me, this has led to customer introductions, advice on how to do business in different regions and I’m planning for my next two hires at the company to be people I studied with during the MBA program.